Python coding helps you with things you do every day, like math homework. Python programming can also help with things like making web pages: Thank goodness for widgets and keywords! Tkinter in Python comes with a lot of good widgets. Widgets are standard graphical user interface (GUI) elements, like different kinds of buttons and menus. Most of the Tkinter widgets are given here. A Label widget shows text to the user. You can update the widget programmatically to, for example, provide a readout or status bar. A Button can be on and off. When a user clicks it, the button emits an event. Images can be displayed on buttons. 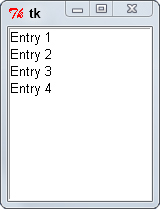 An Entry widget gets text input from the user. A Radiobutton lets you put buttons together, so that only one of them can be clicked. If one button is on and the user clicks another, the first is set to off. Use Tkinter variables (mainly Tkinter.IntVar and Tkinter.StringVar) to access its state. You can display a Radiobutton without the dot indicator. In that case it displays its state by being sunken or raised. A Checkbutton records on/off or true/false status. Like a Radiobutton, a Checkbutton widget can be displayed without its check mark, and you need to use a Tkinter variable to access its state. Use a Scale widget when you want a slider that goes from one value to another. You can set the start and end values, as well as the step. For example, you can have a slider that has only the even values between 2 and 100. Access its current value by its get method; set its current value by its set method. A Scale widget can be vertical (up and down). Use a Text widget to show large areas of text. The Text widget lets the user edit and search. The LabelFrame acts as a parent widget for other widgets, displaying them with a title and an outline. LabelFrame has to have a child widget before you can see it. You use a Canvas widget to draw on. It supports different drawing methods. Listbox lets the user choose from one set of options or displays a list of items. The Menu widget can create a menu bar. Creating menus can be hard, especially if you want drop-down menus. To do that, you use a separate Menu widget for each drop-down menu you’re creating. 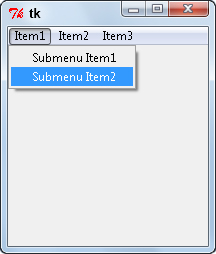 The OptionMenu widget lets the user choose from a list of options. To use the OptionMenu the right way, you’ll probably need to bind it to a separate callback that updates other information based on the user’s selection. Get the currently selected value with its get method.